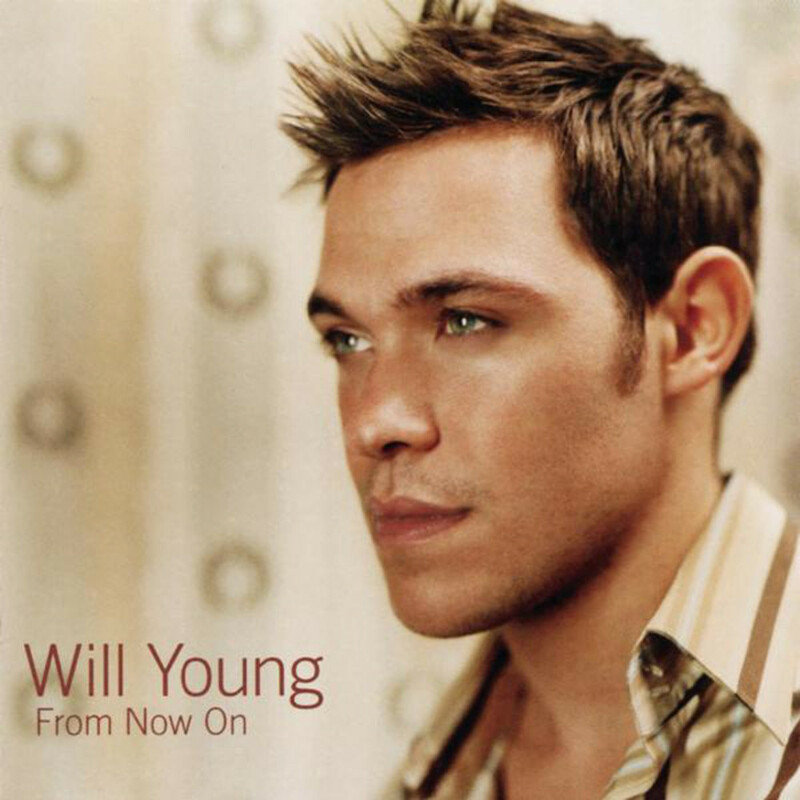 Today’s POP RESCUE from a fate unknown, is the 2003 debut album From Now On from the inaugural Pop Idol TV show winner Will Young. This 13 track album opens with single Evergreen, which formed part of a double-A side single with the track immediately following this. As is customary with a lot of talent TV show winners, their prize is getting a number one by singing some recent cover version. In this instance, it was Westlife who would share in Simon Cowell‘s ker-ching moment. The song itself begins like Bryan Adams‘ hit (Everything I Do) I Do It For You, but it soon allows Will’s distinct vocals to take over, just before it heads off into a slight S Club 7 chorus style that dominated the sound of other’s to follow in Will’s steps (like Michelle McManus) who all get songs about winning or ‘that moment’. It’s a pretty middle of the road song, although Will makes light work of it – even the nauseating obligatory Westlife key-change. This is followed by Anything Is Possible – an original song boasting a co-writer credit for 90’s pop princess Cathy Dennis. This is a much nicer, more up-beat song, although the backing vocals feel a little off at times. Will’s vocals feel like they have more to do here, and once again he delivers his vocals with great ease and warmth. Essentially, this song is another song about winning Pop Idol and gratitude to the judges and viewers. This song would go on to win an Ivor Novello in 2003. A light acoustic guitar and percussive intro welcomes in his second single – a cover of the great Doors track Light My Fire. This is a really nice version, and in my mind after the original, this version is only rivalled by that from Dame Shirley Bassey. The percussion, guitar and strings keep their distance somewhat – with this song being all about showcasing Will’s vocal strength – which really shines here. Lover Won’t You Stay follows, giving Cathy Dennis another credit, and brings in Guy Chambers (Robbie Williams writing partner). This song is more downbeat, giving Will the chance to sing a slower, deeper, richer song. There’s musical echoes of Kylie‘s 50’s/60s sounding Loveboat song here – which was also co-written by Guy. The gentle tempo of Lovestruck is up next (yet again, a Cathy Dennis co-write). This song is another warm, soft song. It feels like a natural continuation from the previous track. There’s some really nice strings, and backing vocals on this song, helping to make it a really nice song. This is followed by the sad abomination that is The Long And Winding Road with Pop Idol loser (and clearly the judges favourite) Gareth Gates. Gareth gets first go, and his higher pitched vocals feel too sugary and boyish. I really don’t understand why this quite frankly not-so-great Beatles song was picked for them. Will’s vocals stand out perfectly here, reminding me of why Will (somehow) thankfully won. This song was Will’s third single, and was another double-A single, although Gareth performed his cringeworthy Elvis Presley cover of Suspicious Minds as a solo – clearly a pitch to get the judges favourite contestant some more attention for his own career. Fourth and final single You And I is up next, which was released as yet another double-A side single with non-album track Don’t Let Me Down, and for Children In Need. This tactic worked, giving Will a #2 hit single in the UK. Of all the songs here, this one probably sounds the closer to the sound that is most familiar to his contemporary music. Eighth track Side By Side feels like the most guitar led track here, but sadly it’s a bit weak amongst the other songs here – lyrically and musically. It feels a bit like a filler and not very memorable. Cathy scores another co-writer credit here, this time with legendary songwriter Burt Bacharach on the gently wafting 60’s sounding What’s In Goodbye. This feels completely like a cover version, but songwriter royalty came together to make this luxurious little number. It’s wonderfully reminiscent, and there’s nothing not to like about it. Will gets his first co-writer credit next, under the watchful eye of Cathy, on Cruel To Be Kind. The piano introduction momentarily reminds me of Elton John‘s hit Bennie And The Jets before switching over to a gently bouncing song – that wouldn’t go a-miss on an S Club album. Will’s vocals are strong here, and his distinct soulful voice really shines again. Over You follows this, and this has a delightful shuffling beat and strumming guitar. It feels reminiscent of a long lost era – musically and lyrically (‘I’ve been feelin’ kinda kooky‘ anyone?). Will is joined by some great backing vocals from Sharon Murphy and the song’s co-writer Richard ‘Biff’ Stannard. This is a great little song – the perfect toe tapper. The penultimate track is title track, From Now On. This is an up-beat, light summery feeling song – laden with guitar and beats. Will’s soulful vocals are perfectly complimented by these and the meandering bassline. A brooding orchestra ushers in the closing track Fine Line. This song is all about Will’s vocals and the string section. His vocals are dark, rich, and strong, and then suddenly delicate and breaking. The strings perfectly compliment this, with cello and violins soaring and falling with him. This song is minimal and beautiful. Over all, I was somewhat surprised by how good this album is. As predicted, it throws in some pent-up S Club pop that must have been originally intended for judge’s favourite Gareth Gates’ anticipated win, but the sum of the greatness of the other songs out-weighs this. Two of the three cover versions really don’t offer anything – particularly the awkward Gareth Gates cover (although he doesn’t get credited on the album artwork), but it’s easy to forgive Will for this, as this is clearly a carefully managed, packaged, set competition winner’s prize. Thankfully, it gave Will a hit, and his skill as a vocalist and performer enabled him to out-grow this album and release greater and far more interesting music afterwards. Where is Will Young now? Will is one of the few TV talent show stars, and particularly as a winner, to have forged a long-term career. He won his first Brit Award the following year. He has appeared on stage in shows including Noel Coward’s The Vortex (2007), and Cabaret (2012). and ventured into film for Mrs Henderson Presents (2005) alongside Judi Dench and Bob Hoskins. He has also appeared in TV shows during 2010-2011 including Skins, Marple and Bedlam. Musically, he has consistently had hit albums, charting at either #1 or #2 in the UK. He released his fifth album 85% Proof in May 2015, which once again reached #1 in the UK album chart. 2002 UK CHART POSITION: #1, certified 2x Platinum. Posted in 2000s, Gareth Gates, Will YoungTagged 2002, album, Anything Is Possible, Burt Bacharach, Cathy Dennis, Elvis Presley, Evergreen, From Now On, Guy Chambers, Light My Fire, Pop Idol, review, Richard Stannard, Sharon Murphy, Simon Cowell, The Long And Winding Road, You And IBookmark the permalink.